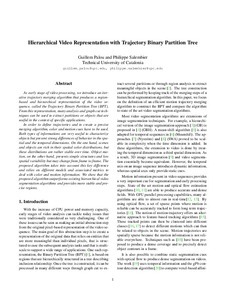 Palou, G.; Salembier, P. Hierarchical video representation with trajectory binary partition tree. A: IEEE Conference on Computer Vision and Pattern Recognition. "CVRP 2013: 2013 IEEE Conference on Computer Vision and Pattern Recognition: proceedings: 23-28 June 2013: Portland, Oregon, USA". Portland, Oregon: IEEE Computer Society Publications, 2013, p. 2099-2106.